Mumbai : The upcoming Bollywood's romantic family drama film 'All is Well' starring Abhishek Bachchan, Asin and also veteran actor Rishi Kapoor in lead roles. the first look of the All Is Well movie depicts Abhishek and Rishi showing their backs to each other. Veteran actor Rishi took it to twitter sharing the first look with caption, "Tinguji goes next generation Lambuji-Tradition continues with Abhishek Bachchan. In All is Well." 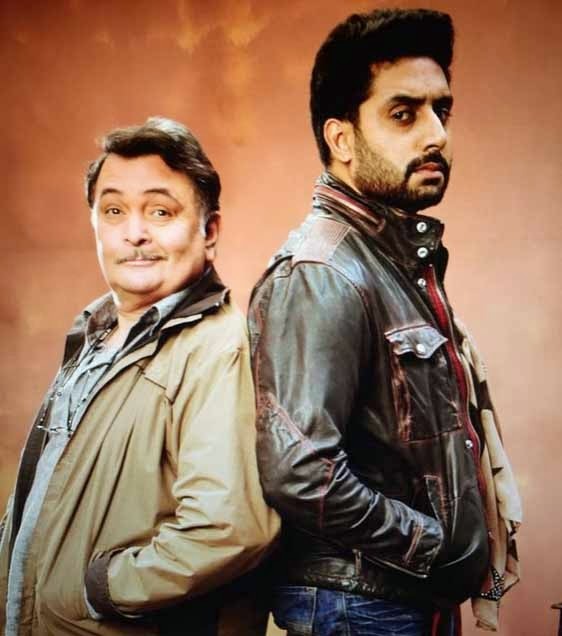 Where Rishi dons a grey jacket with a crooked smile in the first look, on the contrary Abhishek is wearing a brown jacket rendering an intense look in the All is well first look. All Is Well movie is directed by Umesh Shukla and would include a social message as its previous released ‘OMG- Oh My God’. Noticeably there isn’t anything new in Abhishek and Rishi’s look for the film, where Abhishek looks similar to his ‘Bunty Aur Babli ‘avatar contrarily Rishi Kapoor appears same as its ‘Do Dooni Chaar’ character. Nevertheless, it would be very interesting to catch their chemistry for the first time on screen. Bushan Kumar, Krishan Kumar, Himesh Reshammiya and Ajay Kapoor produces the film, which would supposedly release on July 3 of this year.